After an incredibly warm (and low-snow) start of winter in 2018, temperatures plunged to proper sub-Arctic winter values. A few days ago, we were worrying about thawing (with temperatures in the 30s °F / around 0 °C), and then down the curve went. Last night we reached -40 (choose your unit: the scales meet at -40) as per our consumer-grade Davis weather station. That’s the official definition of “cold snap”, and it’s the first of the season. Higher elevations, such as Cleary Summit, a mountain pass on the Steese Highway north of Fairbanks, are currently about 30 °F/17 °C warmer than the valley bottoms. Where we happen to live (and which is why “a house in the hills” is something we keep looking out for). Life as -40 slows down. You can go out just fine, and you’ll be amazed by how well sled dogs are adapted to this extremely harsh weather, but it’s not really fun to exercise outside, plastic is brittle, batteries go flat … and you don’t have time for recreation because you need to keep an eye on the house systems. Especially to make sure that water stays liquid, be it in drains or incoming pipes. The house we live in is made from three-sided logs, which retain heat quite well. We mostly heat with a very efficient and Toyo oil stove. But we have a wood stove to fall back on, in case the electricity or the Toyo have an outage. We decided to fire it up today, to make sure it works well and because it creates a nicer warmth in the corners too far from the Toyo. Wood burning is a huge and complicated political hot potato in interior Alaska, and a topic too complicated to go into in this post. The short version is: it’s traditional, economical and doesn’t require electricity; but it also contributes to air pollution in a way to occasionally render the winter air in Fairbanks one of the worst in the planet, so at a minimum eliminating the most polluting types of burners is quite imperative for the health of the population. This, of course, is measured indoors, not outdoors, and in the 24h average we will quite likely end up in the “moderate” range for the day. We’re fine. On a related note, no one should retain too rosy a picture of the air pre-historic and pre-industrial populations used to breathe. Notwithstanding, of course, their insights about the relationship to nature: if a culture or people practices indoors wood or coal burning for cooking and warmth, chances are that respiratory illnesses were prevalent. Addendum: Approximately 5-6 h after we first started the wood stove, the picture has changed a little bit. PM2.5 values came progressively down to 15-25 µg/m3, pretty much to where they were before we started. Clearly, the first fire-up phase is what generates the most pollution, while collected crud from inside and outside the stove burned off. In contrast, low-to-medium hot, steady operation deteriorates the air much less. Also, I believe it takes a few hours for the catalytic converter to reach its operating temperature. Apparently, letting the stove cool down completely and sit cold for extended periods is a recipe for air pollution. The lesson from this is: If you want to heat with firewood, make sure you have a device with a certified catalytic converter, use it continuously and burn dry, well-seasoned wood. I called it a shootout first, but hey, it wasn’t anything violent. Because I have the best spouse in the world, my recent birthday brought me a whole pile of little boxes with electronic tinker toys, useful ones, straight from Hackerboxes. I’ve since been renewing my acquaintance with the soldering iron and dusted off an old project about building environmental sensor units. One of the development boards I was keen to try out is the pyboard, which is the original or official board for MicroPython. MicroPython is a new implementation of a remarkably rich subset of Python 3.4 to run on microprocessors. I already had a good deal of experience with CircuitPython, the education-friendly derivative of MicroPython published and maintained by Adafruit. Now it was time for the real thing. The pyboard is very compact. For comparison, the grid on my work surface are 1×1 cm. So the plan I came up with is: Gather the temperature sensors from my kit, hook them all up to the pyboard at the same time, log the temperature for a while and compare the outcome. The most expensive item in this set, the Sensiron SHT31-D, uses a CMOS chip to measure temperature and relative humidity, with a capacitive method. I used the lovely little Adafruit breakout board. T range: -40-125 °C, T accuracy ±0.3 °C (between 0 and 60 °C) and up to ±1.3 °C at the edges, RH accuracy ± 2%. Price: $ 14. The prices are 2018 prices from US vendors. By ordering directly from Chinese outlets, you can usually reduce them to ~40%, except for the much rarer SHT31-D, for which only one ready-to-use alternative (which is not much cheaper) appears to exist. The three temperature sensors: TMP36 (left), DHT11 (middle), SHT31-D (right). All code, both on the computer side and the pyboard side, is available in a git repository on GitHub. Two related consideration at this stage: What communication protocol do the sensors use, and what MicroPython libraries are available to drive them from the pyboard? While the documentation for MicroPython is superb, I found the pyboard to be a lot less well documented. MicroPython comes with a library specific to the pyboard (pyb) as well as generic libraries that are supposed to work with any supported board (eg. machine), and their functions sometimes overlap. I had to consult the MicroPython forum a few times to figure out the best approach. The TMP36 is a single-channel analog sensor: The output voltage is linear in the temperature (it boasts a linearity of better than 0.5%). So we need a DAC pin to measure the output voltage at the pyboard (using a DAC object from the pyb module). According to a forum post, the pin output is a 12-bit integer (0-4095) that is proportional to the voltage (0-3.3V). So we get the voltage in mV by multiplying the pin value by 3300 and dividing by 4095. Then, as per the TMP36 datasheet, we have to subtract 500 and divide by 10 to convert that value to °C. Easy. The DHT11 also uses single channel protocol, but a digital one, which looks a little idiosyncratic. (I was a little surprised to find that none of my sensors uses the popular 1-Wire bus.) Luckily, MicroPython ships with a library (dht) that takes care of everything. It outputs temperature in °C and relative humidity in %. The SHT31-D communicates via an I2C bus. I used MicroPython’s generic machine module and sht31 module provided by kfricke that builds on it. This said, the sht31 library doesn’t even need the user to provide the port. I’m just noting this because this task can be a little frustrating on the Arduino platform, and take more tries to get it done. Using the MicroPython REPL, develop the MicroPython code incrementally. The goal is to take a measurement every 10 sec and send the data back to the computer over the USB serial port. Upload finished MicroPython code to the pyboard. Use the USB connection now to receive serial data from the pyboard (using Python 3 on the computer) and also to power the board. Let the assembly collect data for a few hours and write it to a file. I let the experiment run for a few overnight hours in my somewhat overheated home office corner, where the air is very dry. Let’s look at plots of the three temperature curves. At first, I was not impressed: The DHT11 measurements seemed to jump around a whole lot, the SHT31 has a very weird periodic signal and the TMP36 data is incredibly noisy (apart from unrealistically high – the room wasn’t that badly overheated!). What about the TMP36? Well, it’s noisy and operating way outside its nominal accuracy, but at least some of the signal is clearly due to the real temperature variation. The fall-off of the data during the first hour is, btw, probably because I removed my body from the desk and went to bed. The air cooled afterwards. Since I had the relative humidity data, I looked at it, too. Here the SHT31 and the DHT11 agree less well in absolute value, and I think the latter is in agreement with its reputation as not very accurate. I find the SHT31 values a lot more convincing. 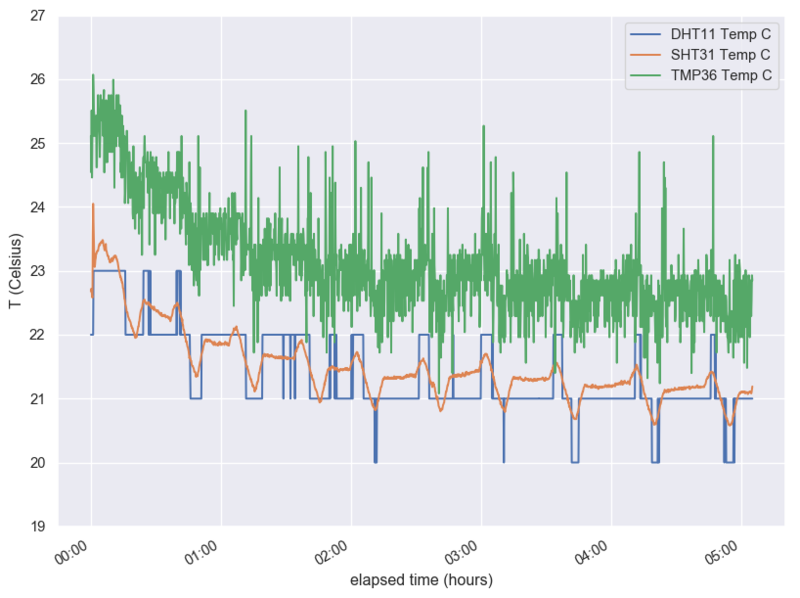 One thing that the graphs don’t show is that if you blow on the sensor, the SHT31 adjusts immediately and goes back to normal pretty fast, while the DHT11 takes a few seconds for its measurement to jump. It also saturates quickly (showing unrealistic nearly-100% of RH) and takes a long time to return from an extreme measurement. What did we learn? What else could we find out? The DHT11 confirmed its reputation as a very basic sensor. Its temperature measurement was in better agreement with what I think is reality than expected, but the relative humidity is not very trustworthy. Its limited range and whole-degree step size make it a mediocre choice for a personal weather station, and its slowness unsuitable for, say, monitoring temperature sensitive circuitry. But could we get a higher resolution with a different software library? Are there settings that escaped my notice? As-is, I see its application mostly in education and maybe indoors monitoring when you don’t need much precision. The TMP36 was disappointing, but maybe my expectations of this $ 1.50 sensor were excessively high. 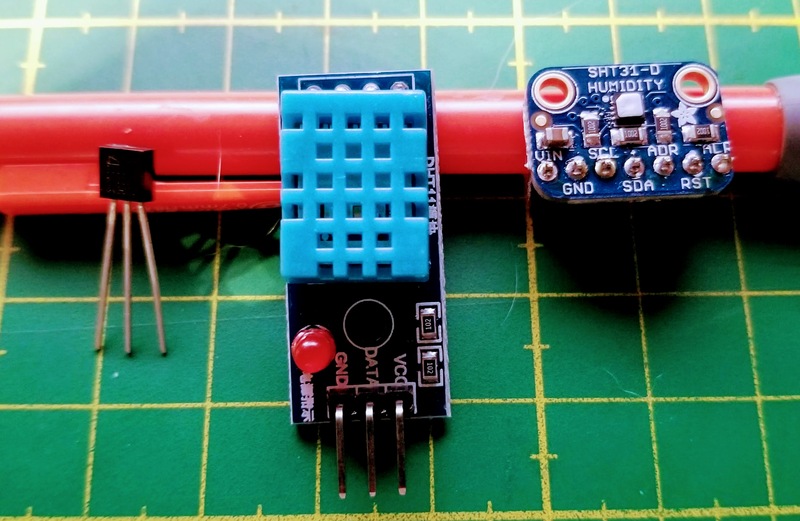 As an analog sensor, it is faster than the DHT11 (though I don’t know how fast … just yet) and can be used for monitoring temperature extremes, but not with high precision because of the noise! Maybe a good approach would be to reduce the noise in some fashion. Also, did I have a bum unit, or do they all need calibrating? Maybe the pyboard-specific conversion formula has a flaw, and a different board or method would produce a different result? The SHT31-D looks like a great sensor all around. Also congratulations to Adafruit for producing an outstanding breakout board. This would be my choice for a weather station, hands down. Other questions I have are: How different would the performance be in a different temperature range? I live in Alaska, and temps went down to -30 °C today. (My medium-term plan is to put a sensor under the snow.) Also, how fast can we actually retrieve successive measurements from our two faster sensors? Last, I think I found at least two more temperature sensors in my kit. How do they compare? Some time during the last year or two there has been a change in my attitude towards serial connections: I used to think of them as a relic of a bygone time, when personal computers came with RS232/DE-9 interfaces and you could find them on all sorts of peripherals. A relic used by scientists and instrument makers for reasons, probably, of expedience. And if your instrument comes with a serial connector, you sigh, go look for a serial-to-USB converter and hope that it’s not one with an unmaintained and buggy driver that for all time will make you doubt in your data. It is true that my deep negativity stemmed from the time I was receiving GPS signals in an airplane and worried a lot about USB buffer lag impacting the time stamps. I still think my worries were founded in this particular application. It is also true that for full-blown precision instruments providing an ethernet interface (or maybe something else?) out oft he box would be highly preferable to the unholy rat’s nest of serial hubs, USB converters and ethernet hubs (not to mention proprietary software to run them) that you find in too many scientific installations. But since I’ve been playing with electronics and development boards, dealing with UART feels completely normal and appropriate. I own a bunch of converters (USB-to-UART, USB-to-DE-9) with FTDI chips, which work very well. And while it’s true that I’m far from understanding everything about serial communications, and am still leery of the reliability of timings below the ms level, it’s a lot more convenient and manageable than other options. I often use Python to plot data on a map and like to use the Matplotlib Basemap Toolkit. In practice, I use a lot of different libraries to access various data formats (raster, vector, serialized…), select and analyse them, generate, save and visualize outputs, and it’s not always obvious to string one’s favourite tools together into efficient processing chains. For example, I’ve also become fond of Pandas DataFrames, which offer a great interface to statistical analysis (e.g. the statsmodels module), and its geo-enabled version, GeoPandas. Both Basemap and GeoPandas can deal with the popular (alas!) ESRI Shapefile format, which is what many many (vector) GIS datasets are published in. But they aren’t made for working together. This post is about how I currently go about processing Shapefile data with GeoPandas first and then plotting it on a map using Basemap. I’m using an extremely simple example: a polygon Shapefile of the earth’s glaciated areas from the handy, and free, NaturalEarth Data site. The data is already in geographic coordinates (latitudes/longitudes), with a WGS 84 datum. We therefore don’t have to worry about preprocessing the input with suitable coordinate transforms. (Often, you do have to think about this sort of thing before you get going…). All my code is available in an IPython (or Jupyther) Notebook, which should work with both Python 2 and 3. Features that add on to these include plotting parallels and meridians, scale bars, and reading Shapefiles. But we don’t want to use Basemap to read our Shapefile — we want to plot the selections we’ve already made from the Shapefile on top of it. We could do a lot more — add labels, plot glaciers in different colors, for example. Feel free to play with the code. As a Google Chrome user (alternating with Firefox depending on usage scenario: I’m a multi-browser person) and satellite imagery person, I’ve been enjoying a browser plug-in called Earth View, which customises every new tab with an image out of Google’s collection of particularly spectacular satellite imagery. These images are drawn from the DigitalGlobe and Astrium/CNES imagery that Google acquired for use in Google Earth and Google Maps. DigitalGlobes launched and runs the IKONOS, GeoEye and WorldView series of commercial satellites, and Astrium (or their parent company) operates the SPOT and Pleïades and other satellite platforms for the French and European space agencies. This is high-resolution optical imagery on a scale of 50 cm to 2.5m. Or click on the hidden arrow to the right to find other places, such as in the US, Egypt, or Spain. It’s already been two months, and I still haven’t posted about going to PyCon in Montreal. I had a wonderful experience! Many thanks to the PSF and PyLadies, whose travel grant brought the cost down into the realm of the feasible for me. Indeed, all the talks are available in a YouTube channel and on pyvideo.org. These are not my best-of PyCon talks. Some talks that were excellent I left aside in favour of some that have a clearer utility for someone working in scientific research. Most of these are 30 min talks. Some are 45 min. The ones that are marked as “3h” were tutorials, and may be somewhat tedious to watch — except if you really want to learn about a topic in-depth, in which case you’ll be happy they exist. Otherwise, skip! I organized them roughly by topic area and added annotations. If you only have time for a few, my suggestion is to start with the ones with the asterisk. (Again, not because they’re necessarily the best, but because I think you get a lot of reward for your time investment). [debugging] Clayton Parker – So you think you can PDB? [multiple inheritance] Raymond Hettinger – Super considered super! [concurrency] David Beazley – Python Concurrency From the Ground Up: LIVE! [Python processes] Ying Li – Where in your RAM is “python san_diego.py”? 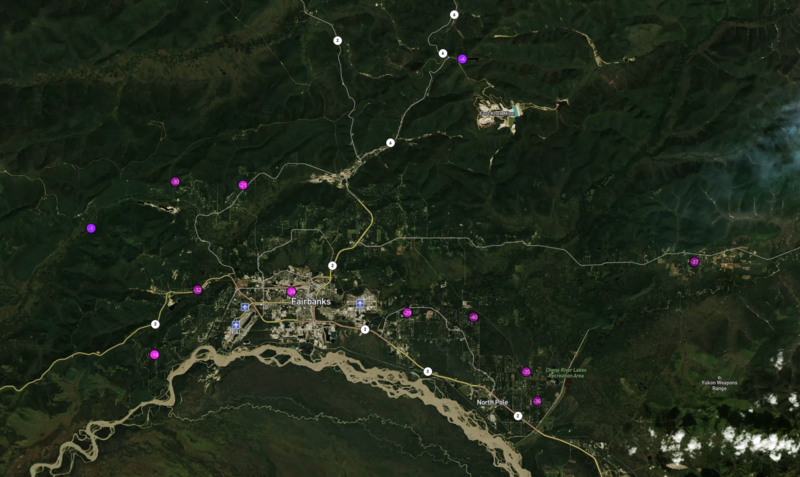 Like many, I’ve been following the developing story of the large spill of mine tailings and water following the failure of a tailings pond dam at Indurstrial Metal’s Mount Polley mine near Likely, British Columbia, Canada. There has been much impressive video, but I haven’t seen a good map of the lay of the land. So I made a quick one from Landsat imagery. The before/after comparison shows the same location on the Tuesday before the spill (which happened on Monday, Aug. 4, 2014), and a week later. Debris, which after a day has not yet reached the town of Likely towards which it was headed, is visible in Quesnel Lake (and Polley Lake). Hazeltine Creek, which must have been a small stream passing close to the pond before the breach, is widened and filled with muddy water on a length of several miles (recognizable by the lighter colour). From the numbers I’ve seen, the volume of water:sediments in the spill was about 2:1, so we’re talking about liquid mud. I put in the 1 mi scale by eyeballing it — it’s not precise, but Polley Lake appears to be about 3 miles long. These images are made from Landsat 8 scenes, which are available freely (simple registration requrired) from USGS (http://earthexplorer.usgs.gov). I did not process them myself, but took the shortcut and downloaded the pre-processed “LandsatLook” images, which USGS provides for illustration purposes (rather than science and image processing). These are JPG files of about 10 MB, which aren’t at full resolution. If I processed the file from the original scene, it would look better, but I didn’t want to download 2 GB of full-scene data and take about an hour to process it myself last night. Numpy arrays are a fundamental tool for scientific data processing in Python. To deal with spatial data that is geo-referenced on a rectangular-grid raster the GeoTIFF file format is similarly ubiquitous. Saving spatial data that is held in a Numpy array to a GeoTIFF file should therefore be an extremely common task, so it was surprising to me to run into some pitfalls. This post is a write-up on how to get around them. To access GeoTIFF files I’m using the Geospatial Data Abstraction Library (GDAL), a powerful set of tools that comes with multiple command line utilities and bindings for the most common scripting languages used in science. As it is originally a C/C++ library, it can be quite unpythonic — one of many reasons why you might want to write your own library for your specific purpose. Figure out the spatial reference system (coordinate system and, if applicable, map projection), usually from the source data set, and get the Well-Known Text representation of it (examples). Figure out the geotransform, that is the parameters that describe how the data has to be shifted and stretched to place it on the spatial reference system. This, too, will be derived from the source data and whatever manipulations were subsequently carried out. Thus far, there’s nothing difficult about it. But the problem arises on line 18, where the data type is passed to the Create() method. gdal.GDT_Byte refers to a code for GDAL’s Byte data type, that is, an 8-bit unsigned integer. If the final data is of a different type, 16-byte signed integers, say, or floating-point numbers, I could use one of the other GDAL data types. But I’m writing a library and am therefore unlikely to know the data type beforehand. So what is needed is a general mapping from Numpy dtype objects to GDALDataType objects. And that problem had me stumped for a moment. OK, it would be possible to guess — there aren’t that many of them — but shouldn’t there be a function? Huh? Well, the first thing I learnt from the Python documentation is that for the == operator to return True the two objects aren’t always required to have the same type. In some cases this seems to make more sense than in others. The second is that evidently, gdal_array.NumericTypeCodeToGDALTypeCode expects an object of type type (that is, Python type), which numpy.float32 appears to be, whereas my_data.dtype is, surprise surprise of type numpy.dtype. That’s a start. Some hand-editing is in order, for example, mapping Booleans to 1 to make it possible to encode them as integers for persistence — clearly, GDAL has no notion of bit or binary objects. Also, it is odd that both int8 and uint8 should be mapped to GDAL Byte types, that is, unsigned integers. That needs to be taken into account when manipulating the data. In addition, several complex Numpy datatypes are missing and could be manually mapped to 10 or 11. I am aware I could have used CreateCopy() in such a simple case, but Create() is more generally versatile. The second note is that I am aware that the problem isn’t specific to GeoTIFF files: it arises for any data file with GDAL whose driver supports a Create() method. But to be honest, GDAL is pretty unwieldy for most scientific data formats, so if I were to write NetCDF or HDF5 files, I would use appropriate specific libraries, most of which tend to be aware of Numpy and its data types. Up until recently, I basically ignored Python 3 in my day-to-day Python practice. Sure, I listened to some podcasts and read some articles, but Python 2.7 is doing everything I want, so why add another item to the load of things to think about? Turns out, I’m currently writing a little library, and the question arises, should I support Python 3? If yes, how, and how hard is it? Or maybe I can claim that the scientific Python tool set is not quite ready for Python 3 and can ignore it for a little longer? Well, no such luck — once I went ahead and installed it to see for myself, Python 3 with the packages I use most intensely turned out to be astonishingly well-behaved. Here is how I proceeded, both for my own records and in case this is useful for someone. System before install: Apple OS X 10.6.8 (Snow Leopard) with Python 2.7.5 from python.org installed as the default Python. I use Doug Hellmann’s virtualenvwrapper to manage my virtual environments, but up to now I didn’t use –no-site-packages, and some packages (scipy, for example) are installed globally. As far as easily possible, packages are installed with pip. However, the underlying shared libraries that are prerequisites for some of the scientific Python packages  are mostly managed with Homebrew. I downloaded the DMG file called Python 3.3.3 Mac OS X 64-bit/32-bit x86-64/i386 Installer (for Mac OS X 10.6 and later) and ran it. This didn’t overwrite the python command. Python 3 is, as expected, in /Library/Frameworks/Python.framework/Versions/3.3/, and the python3 executable is symlinked to /usr/local/bin/python3. The last command is to check that the pip command is indeed the one in our new virtual environment. Note that most of these require shared libraries to be installed beforehand. pyzmq requires zeromq for example; pyzmq, tornado and jinja2 are required for iPython (which is called afterwards as ipython3). The Geospatial Data Abstraction Library can be quite tricky to compile if you need support for many scientific data file formats (the HDF family, netCDF, …. ), but luckily it doesn’t care if it is bound into Python 2 or Python 3. Matplotlib will also install some prerequisites. There were two glitches, one to do with the Matplotlib Basemap toolkit, the other with scipy. It installed fine, but importing Basemap (“from mpl_toolkits.basempap import Basemap”) fails with the error “ValueError: level must be >= 0”. Some googling shows that this has happened for a few Python packages with Python 3.3.3. Maybe upgrading the Basemap toolkit to the newest version will fix it. Right now this isn’t the highest priority. As for scipy, the issue was quite different: A C code file (implementing a highly specialized numerical linear algebra algorithm — unsymmetric multifrontal sparse LU factorization) refused to compile (_umfpack_wrap.c). I am doubtful the issue even has anything to do with Python 3. In any event, I had been using a binary scipy package with Python 2.7, so I wouldn’t have seen the issue. The solution was provided on a mailing list, to remove UMFPACK altogether (“export UMFPACK=None”), and indeed scipy installed just fine without it. There is a related issue open for scipy on Github. Python 3 feels just like Python always did! I don’t think the upgrade will change my way I go about designing software in Python, which is a relief. I made an iPython3 Notebook showing off some basic tasks (“open some weird scientific data files, read some metadata, plot the contents”). The top of my list consists of zeromq for iPython; gdal, geos, proj and maybe udunits for projected geospatial data; libpng, libtiff, libgeotiff for imagery; hdf4, hdf5, netcdf to access the scientific file formats I use most often — your list may be slightly different. Yesterday, a friend posted this chart to Facebook, noting that the topic was “uk ph.d. graduate career paths” and that in their experience (as an academic in North America), the percentages looked pretty close. 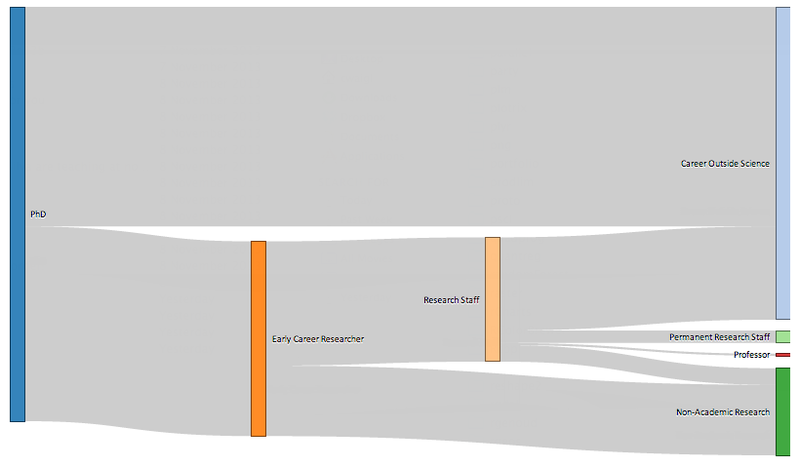 I share my friend’s concern about career options for PhDs, but looking at the diagram, the thing that stands out to me is how terrible it is — as a chart. This diagram illustrates the transition points in typical academic scientific careers following a PhD and shows the flow of scientifically-trained people into other sectors. It is a simplified snapshot based on recent data from HEFCE, the Research Base Funders Forum and from the Higher Education Statistics Agency’s (HESA) Annual Destinations of Leavers from Higher Education’ (DLHE) survey. It also draws on Vitae’s analysis of the DLHE survey. It does not show career breaks or moves back into academic science from other sectors. 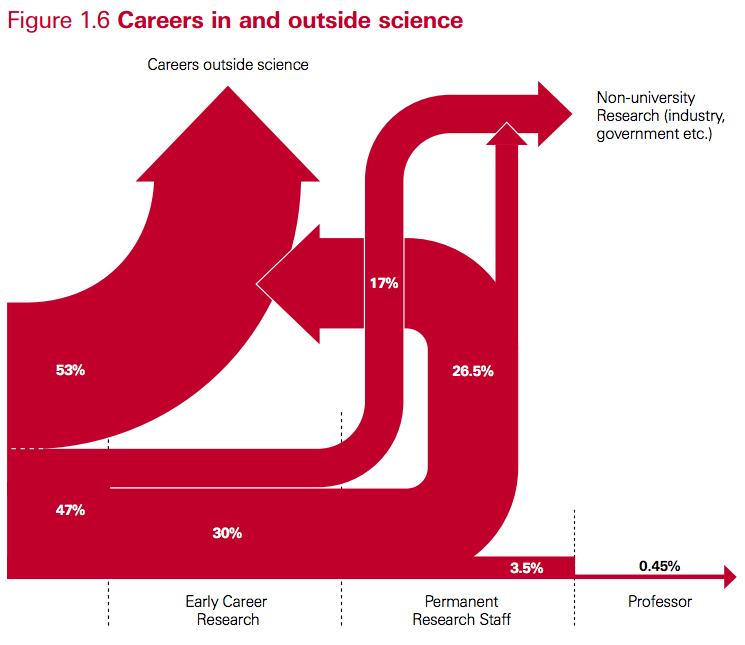 Does it really mean to suggest that no one goes from “Early Career Research” (that is, a post-doc) to “Career Outside Science” (or to industry research)? In my experience, watching post-docs, that is quite a common choice for post-docs precisely because non-academic jobs may be offering better pay and conditions, or because they don’t have a choice at that stage. Well, the fonts are too small. Click for full-sized image. The cleaner chart illustrates most of the issues with the original one. Clearly it is unrealistic that any post-doc who later ends up in a career outside science or in non-academic research goes through another academic research staff position first. (And some go from post-doc directly to professor.) A bigger problem is the absence of differentiation by discipline. What does it mean that maybe 25% of STEM PhDs go through a period as temporary academic researchers before ending up outside science? I completely agree that this part of a researcher’s career is currently highly problematic in most Western countries (keywords: low compensation, high job insecurity, high expectations of personal investment in research), but there is a huge difference between a graduate from many engineering disciplines, where highly qualified people are finding highly satisfying “outside science” jobs, and fields where not staying in academia or public research after a PhD is the equivalent of a career change (think of astrophysics or pure mathematics). Also, the longer I think about it and look at some of the source documents (Vitae report, PDF) the more questions come up. Does Medicine count? Is teaching part of “career outside science”? What about higher education lectureships? So in the end I remain with the feeling that no graph would have been more useful than this graph. The only thing it illustrates is confusion and uncertainty in the career paths, and as such, wouldn’t using a work of art to make the point have been more honest than what I can only call the illusion of science? For anyone interested, the code is here. It was also an opportunity to try out graphs in R.